I was going to write about the joys of being self-employed and having to deal with HM Revenue & Customs. But it is too depressing. So I will save that for another day, in my rapidly-expanding virtual folder of 'potential blog posts', along with other ideas such as interactive fiction via games, issues related to self-publishing, my timeline of projected publications, and using speech recognition software as a writer. It is so easy to write words about writing words. Instead I'm going to let myself get distracted. Do you have a blog or website? Do you find yourself poring over statistics, getting excited because another fifty people from Poland read your blog post about the perfect pierogi? I was fiddling with my blog stats this morning and noticed that there had been a peak in visits since the 11th February. (I should say that it was a peak above my normal average - nothing at all compared to a massive spike in January when a link to one of my blog posts about DRM had appeared on a popular website). 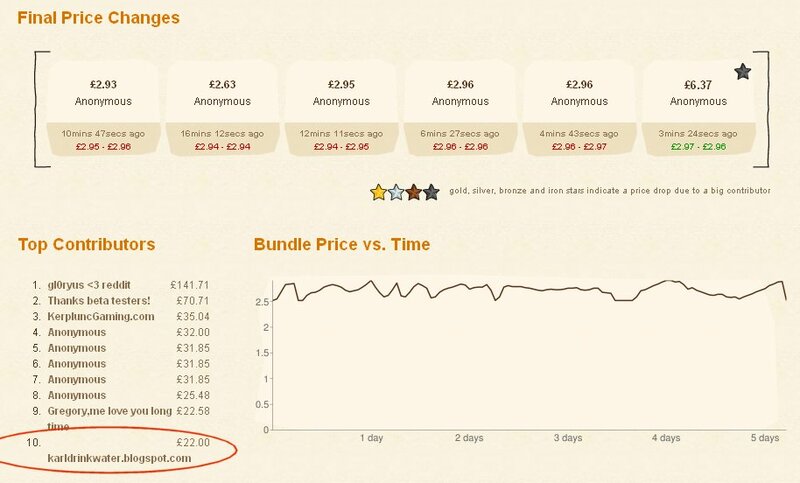 It is then possible to track down the source of the hits, where people are being directed from, and I was surprised to see that it was a site for one of the indie bundles - where you pay what you want for a pack of indie games (DRM-free if they are from Humble Bundle). In this case it was a set of games I bought from Indie Royale. They display the top ten contributors and the price paid for all the games (the average being around £6). It just so happens that I scraped into that top ten and stayed there because I paid more than the average - and obviously some people then click on the link in that table. 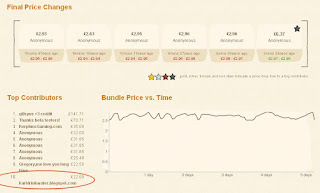 I had forgotten about that purchase, but it shows how getting extra links to your blog from all sorts of locations can be effective for generating interest; and if you can do so whilst also supporting independent game developers (and getting some nice new games) then it is a win for everyone. As many of my friends will testify, I spend a lot of my life campaigning, complaining and being grumpy. It makes a pleasant change when I can look at some numbers and statistics, have an "Aha! I'm like a techno-Holmes!" moment, and realise that the glass is half full. I love checking my blog stats - I have to do it daily. I find that quite a lot of my visits (to my library work blog and yoga blog) are from search engines, and it shows the search terms. Several times for my work blog I have then written a blog post on that topic, as it's obvious that it's something that people are looking for. I think some of the stat checking is just for interest, like being able to look under the bonnet of a car and start to piece together how it works, but it can also be useful as you point out Alyson.